Have you noticed the temperatures inside your computer steadily rising? It happens to every machine at some point and you’re likely going to need a better cooling system. Water cooling can be messy and very involved whereas a case fan can be either plug and play or monitored and tweaked constantly by software, depending on how interested you are. We’ve reviewed some of the best case fans in the market to save you time and allow you to make a decision that’s right for you. Now that you’ve glanced over our recommendations, let’s take a more in-depth look, starting with the Noctua case fan. 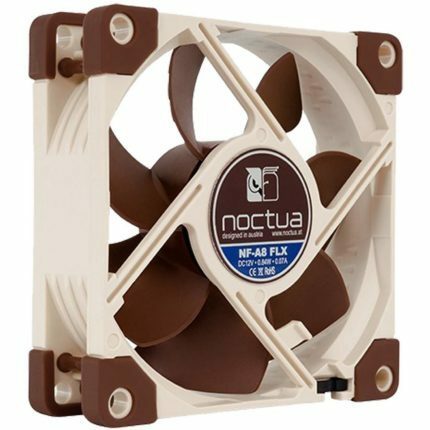 Noctua is known for making high quality yet small fans, and they pride themselves on being very quiet. The NF-A8 FLX Premium is one such fan. Despite being a three pin fan, it comes with attachments for low noise and ultra-low noise which act as a sort of physical fan speed limiter. These limit the fan speed to 1650 and 1200 rpm respectively, down from the standard 2000 rpm. This fan is exceptionally quiet, and cannot be heard over ambient room noise unless you’re very close to it. With the ultra-low noise attachment on, it’s silent, even at full power. One of the reasons it’s able to reduce noise so much is due to the attachment mechanism. The Noctua uses rubber pins instead of screws to attach to the case since screws can cause noise from vibrating due to the movement of the fan blades. This fan provides pretty good cooling considering its small size, and with a few of them, you’d probably produce enough cold air to cool your entire system unless you’re running an overclocked behemoth of a PC. If you are, we’d recommend getting a larger fan. Whilst it’s slightly more expensive than a standard 80mm fan, this Noctua case fan is well worth the money for the performance you get in return for these few extra dollars. If you’ve always used the stock case fans, this will be a real eye-opener for you. The Antec Tricool is a very inexpensive fan but that doesn’t mean it’s not good. In fact, for under $10, it packs a punch as far as cooling is involved. Being slightly larger than the Noctua model means that its CFM is slightly higher, and we found its cooling potential to be adequate for a low-end system, whilst three were enough for most PCs. If control is your thing, this is the perfect fan for you. It has a switch which offers three fan speeds, the highest being 2200 rpm. But that’s not all: whilst technically a three pin fan, it comes with a four pin adaptor so that you can control the fan speed using specialized software. This is perfect for if you want a specific fan profile for gaming, watching a movie and so on. Although it is very quiet, the Antec can’t match the level of silence that the Noctua has, and can reach 38 decibels (which is standard). With the other fan speeds, it can go as low as 15 decibels, which is extremely close to the Noctua in terms of noise, but you do lose some cooling power as a result. The Antec is a good performer, but its main strength lies in its flexibility. For less than $10, you can have a customizable fan that’s reasonably quiet and pretty powerful too. What more could you want? 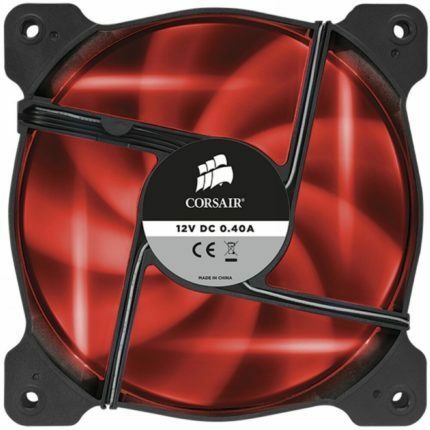 If you’re looking for a larger fan, you can’t go wrong with the Corsair Air Series AF120. It features LED lights (and these come in a variety of colors), so it looks great on just about any system. When it comes to airflow, this fan is amazing. It moves 52 cubic feet of air per minute which means that with a couple of these, your system should be nice and cool even if you overclock other components. Under load, the fans produce around 25 decibels of noise. This is slightly below average, but it is still nothing to brag about. With a four pin adaptor, you can lower the speed to offset some of the noise, but this isn’t included with the fan. We thought the fan lights might be a bit too powerful and create distracting illumination on the surface behind them, but actually, they’re pretty good: bright enough to look great, but not bright enough to be annoying. 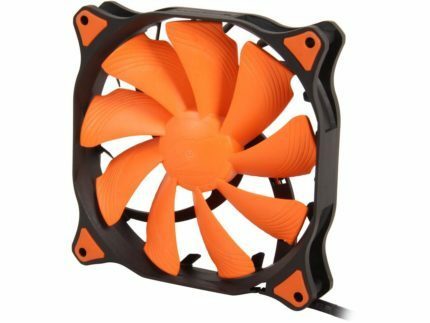 Overall, these fans would be great for a gaming PC, since they look great and provide a decent amount of cooling, whilst not being too loud. We’d have liked to see a four pin version, but since adapters aren’t expensive, this isn’t a huge deal. Okay, we’re onto the big fans now. The Cougar Vortex CFV14HP towers above the other fans in this list in terms of cool air output, its CFM of 70.5 more than double the CFM of the Noctua. In other words, this is a powerful fan. The product itself has a four-pin connector, which is expected with fans of this size. You don’t buy a really big fan and leave it at stock settings. The design is simplistic, and although the fan blade color is distinctive and eye-catching, we’d have liked to see some choice of colors, since the orange won’t go well with anything other than a black case. That said, if you can’t see the back of your tower, it likely won’t matter much to you. As far as sound goes, given its large frame, it’s bound to be a bit louder. It’s actually not too bad, although for some reason it does vibrate quite a lot, which creates noise through the actual PC case. For this reason, we’d recommend using rubber plugs rather than screws to secure it, and also tying up any loose cables inside the PC itself to avoid the sound of them hitting the sides. Overall, this is a powerful fan, more than enough for any low-end machine and even a really high-end machine should only need a couple of these to provide adequate cooling. It’s a bit of a shame about the paint job, but for the price, this is a great choice of a case fan. Case fans come in a variety of sizes and are measured in millimeters (80mm, for example). 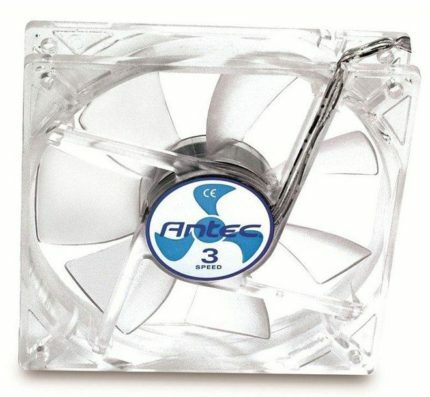 Bigger fans can push more air through without spinning as quickly, which means they’re quieter, but may be too big for your case. Most cases can handle 120mm or 140mm fans, so make sure you check exactly what sizes yours can take before you buy. Fan speed is measured in Revolutions per Minute (RPM). Higher RPM means more noise but also more cooling power. It’s possible to change the RPM of a fan using software though (although the process is more involved with a three pin fan), so don’t let the idea of noise put you off if you’ve found a fan that you really like. This specification tells you how much air the fan is capable of moving per minute. Higher numbers mean more cooling, although it may come at the cost of being slightly louder. Again, your fans don’t have to run at full power all the time, so usually picking one with a high CFM is a good choice. We’ve searched all over to find you the best case fan around, and whilst all of our recommendations are great fans in their own ways, we found that the Noctua NF-A8 FLX Premium provides the best performance for most people thanks to its tiny noise output and a decent amount of cooling power. Our research has been thorough and in-depth, so rest assured that your perfect fan is somewhere on this list and buy with confidence knowing we’ve done the hard part for you. As always, thank you for reading and we hope you’ll join us again the next time you need advice.